On the face of it the Soviet Union had awesome armoured forces at the start of World War II, but huge numbers of vehicles were broken down or unserviceable, and in the early part of the war they were poorly used, leading to enormous losses. As the war progressed the Soviets learned to better use their tanks, and improved machines like the T34 plus well trained crews, and a drop in the quality of German tank units, meant they became more than a match for their opponents. All World War II engagements used large numbers of armoured vehicles, yet so far few sets of figures have been made to crew these. 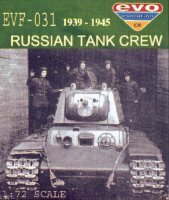 This set from Evolution is an important addition to the available Red Army figures, and features 14 poses which are either in, on or near a tank. The first few figures have no base and are clearly meant to stand inside the tank itself. Some are watching and could be in battle, while some are clearly on parade, saluting or even carrying a flag. Other figures are also without a base, and are suitable for positioning on the tank, while the last few would seem to be crewmen who have abandoned their vehicles and carrying on the fight as infantry. This would have been all too common as poor vehicles broke down or were destroyed by enemy fire. Some are clearly celebrating, and one has obtained some bottles and is ready to party (or perhaps those are Molotov cocktails?). While not all are suitable for battle, there is a nice wide selection of poses here with something for any occasion. As was so often the case in this and in many wars, clothing tended to vary quite considerably, and was often non-regulation. Most of these men wear the recognisable Soviet padded tank helmet, developed from World War I pilot helmets, which began the war in leather but was later made of canvas. Many wear overalls, which was the main active service dress, but there are also figures wearing leather jackets, the quilted telogreika, the gymnastiorka, and one wears the shuba sheepskin coat - all perfectly appropriate to this corps, and all well done. The style of these figures is that of many sets currently produced in Eastern Europe. Although there is a good amount of detail, they are not as sharply defined or elegant as the best appearing from some of the big manufacturers. The poses tend to be a little flat, however the animation and proportions are OK if a trifle stocky. Flash is in noticeable quantities, and occasionally the two halves of the mould seem to be slightly misaligned, but nothing that a sharp knife and some patience cannot remedy. This is a solidly done and versatile set that will be invaluable to anyone setting up a Soviet armoured unit. It covers its subject well, although the fact that each pose is in equal numbers means buying multiple sets will leave you with many men waving bottles in the air, which will not please those wargamers needing many sober and serious crewmen.